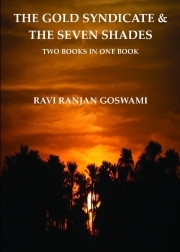 Description of "THE GOLD SYNDICATE & THE SEVEN SHADES"
First part of the book tells a thrilling story about a big gold smuggling case in India.The second part contains seven interesting short stories inspired from the real social conditions in India. An interesting and engaging read for all. Author is a science post graduate.He is from Jhansi and lives in Kochi,India with his family. Reviews of "THE GOLD SYNDICATE & THE SEVEN SHADES"